The quick answer - Yes and No. Tree squirrels such as the Eastern Gray Squirrel and the American Red Squirrel do not hibernate, but tend to sleep a lot during the winter months. Ground squirrels on the other hand such as the large yellow-bellied marmots found in the Rocky Mountains will often tuck themselves away by early October and are not seen again until April or May. Many animal lovers across North America are united on many different fronts, but one question that has some divided is do squirrels hibernate? Some say they do hibernate but wake up at different times, and others say that squirrels are too small and cannot store up enough body fat to really hibernate. Animal experts and other scientists have been curious about this very same question and have been conducting research for decades. This research has also lead to several different discoveries that might be helpful to people’s health in the future. So, let’s look at the information science has to offer about squirrels and hibernation. Squirrels are found everywhere in the world , excluding Australia. Some are very large, like those found in India. Others are very tiny. One of the smallest is the Pygmy squirrel found in Africa. The squirrels we are interested in and whether they hibernate or not are those found in the North American continent, specifically the gray squirrel, and the ground squirrel. Both of these type of squirrel eat nuts, seeds, berries, leaves, roots, fruits, insects, caterpillars, and different grains. Sometimes they will eat eggs they have stolen from a nest, but that is not a staple of their diet. What do the experts say about these two different types of squirrel and whether they hibernate or not? This zoo has many eastern gray squirrels on their grounds, although they are not found in an exhibit, but rather just inhabiting the grounds as they please. The zoo claims that these squirrels don’t hibernate because they are homeotherms. Homeotherms regulate their body temperature, maintaining it at about the same temperature year-round. Another site, which isn’t as authoritative, also says gray squirrels don’t hibernate during the winter months. However, hibernation is not a state that is kept for the entire duration of the cold season. Animals do come out of hibernation, only to return to it soon after, sometimes several times. This can and does happen, especially if the squirrels know that there is a food supply waiting for them and is easily available. If people in the area set food out for birds, rabbits and other animals, including their own domesticated four footed friends, such as their dogs and cats, squirrels quickly learn where those places are. If the squirrel population is large enough, then people in the area might assume that all of the squirrels are active, all of the time, when in reality, only a fraction is outside of their den at any given time, with the majority peacefully hibernating, out of sight. It also might be only certain types of squirrels, including gray squirrels, who do not hibernate. Many other sites state the same claim about gray squirrels. Some explain that many college campuses are home to this type of squirrel. With classes in session during the winter months, it may be possible for squirrels to gather food more easily from students’ handouts than it would be in other areas. There would most likely be fewer predators such as domesticated cats and dogs. However every site that said that squirrels did hibernate specified that they were talking about one of the ground squirrels. Gray squirrels were never included in these sites. National Wildlife Federation’s article about Brian Barnes, the director of the Institute of Arctic Biology at the University of Alaska in Fairbanks explains that animals that hibernate do so in anticipation of a famine. Famines aren’t always caused by desert conditions. Famines are simply when there is no food available for an extended period of time, mainly because of the environment. Since food doesn’t grow well in cold conditions, winter can be viewed as a time, although short by human standards, of famine. To animals, winter could easily be interpreted as a short, and regular, time of famine and cold. Barnes has studied hibernation and the animals who practice it for over 40 years. He has learned that the different animals who do hibernate can control their body’s cells so that the need for oxygen and energy are greatly reduced. He says that many hibernating animals can live longer because they experience less environmental stress than other animals similar to them in the same environment. This is one of the many aspects of hibernation that researchers in science and medicine are extremely interested in learning more about. During his research on hibernating animals, Barnes has concluded that the ground squirrel is one of the best hibernating animals that he has studied. This is because ground squirrels can hibernate for longer periods of time than other animals that hibernate are capable of doing, which can help ground squirrels when there are extended or extreme weather conditions. But he also explains that since ground squirrels are rodents, they must also wake up to urinate. Bears don’t have that problem, because they are able to shut their kidneys down to the point of having almost no activity, and greatly decreasing the amount of urine that is produced. He says because of this, bears don’t have the problem of waking up, only to fall back into a state of hibernation. Barnes says that not only ground squirrels, but also bears, suffer no loss of bone and very little loss of muscle during hibernation, leading researchers to study these animals in hopes of helping patients with osteoporosis or broken bones. Another thing he is interested in is how the slowed blood in these animals does not clot. He is interested because this knowledge could help save the lives of heart attack victims. This website explains some more of Brian Barnes’ research into the hibernation of ground squirrels. About 25 years ago, Barnes had several captive ground squirrels. He implanted radio devices in the squirrels that would send him information about the squirrels after they were released. He found then that their temperature drops drastically. He has since found that the squirrels somehow cleanse their blood of any impurity that could allow water in the blood to crystallize into ice. Ice crystals must have something to adhere to in order to form. Since ground squirrels lack the proteins similar to antifreeze that fish have to allow for this supercooling to take place. One of Barnes’ associates, Melanie Richter, conducted her own experiments involving hibernating ground squirrels. She was curious to find out how low a ground squirrel’s temperature could go. She lowered the temperature until it reached -26° C. Her research shows that at this point the ground squirrel started to shiver, which is a means for the body to produce heat, and came out of hibernation. A video showing some of the research being carried out in 1972, by Eric T Pengelley, Ph. D. at the University of California in Riverside, California, on the golden mantled ground squirrel, shows us many things about hibernation. One thing we learn is that when an animal is in a state of hibernation, the animal is extremely difficult to wake up. The film states that hibernation “is a complete slowdown in life processes.” When an animal comes out of hibernation, these processes must be increased, slowly and gradually, as the animal comes out of its hibernating state. The environment, and not just the animal, must be manipulated so that the temperature of the air becomes warmer, and the lighting levels must be increased so the room is brighter, as well. It takes several hours for the squirrel to become fully alert Also, not only is the hibernating ground squirrel being shown in the video’s second half is able to be handled without becoming active, but the thermometer shows that the animal has a very low internal temperature of 4° C, and the EKG machine shows a heartbeat of only four beats per minute. This is definitely not sleep, but hibernation. Normal readings for ground squirrels are for a much higher temperature at 37° C and also a much faster heart rate, around 400 beats per minute. Sleep, even a very deep sleep, does not change the physiological processes of an organism to that degree. Only hibernation can cause an animal to do that. Sleep also allows an animal to respond to outside stimuli in a rapid manner. Hibernation disallows for a rapid rousing, and can take hours to complete before an animal is able to defend itself, eat, or even walk. Waking from sleep is usually accompanied by stretching the muscles, rolling around a bit, and opening the eyes. Hibernating animals first begin waking up by deep breathing, although at a much slower than normal rate. Then the heart rate increases slowly, and the temperature slowly climbs. An animal does not need to go through this if it is just in a deep sleep, but it will do these things if it is truly hibernating. Sleep also occurs in animals that hibernate, but in the warmer months, at regular times, such as night and during the middle of the day, which is also similar to when many non-hibernating animals can be found sleeping. The dividing line between those squirrels who hibernate and those who do not is simply explained in one line on the National Geographic Society’s page about squirrels: “Other species are ground squirrels that live in burrow or tunnel systems, where some hibernate during the winter season.” This is all it says about the question regarding squirrels and hibernation. 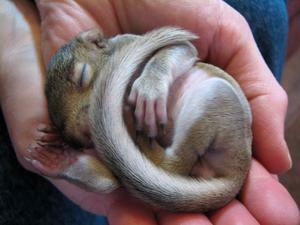 Simply put, some squirrels do, and some squirrels do not, hibernate. Many scientists, especially medical researchers, are interested in finding out why hibernating animals do not suffer from muscle atrophy. They are also interested in learning more about the processes that allow animals to slow their hearts down to such a slow pace. Finding the answers to these questions and others posed by scientists and medical researchers can benefit people with many different medical ailments. Animals who hibernate are also able to keep all of their muscle function after completely coming out of hibernation. People coming out of comas, regardless if they are induced or accidental, lose much of their muscle function. Research may someday have the answers that will helps hundreds of people not only wake up again from comas, but lead lives that are more normal than what was possible before. So, do squirrels hibernate in your area? It turns out that not all squirrels hibernate, but ground squirrels do. The gray squirrels still sleep a great deal and are active only during the morning and evening, but they still do not sleep as deeply as ground squirrels hibernate. Both types of squirrels wake up during the winter at different various times and become active, but the ground squirrel returns to a hibernating state, much like bears do. 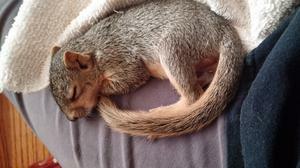 If you have gray squirrels, look for them in the morning and in the evening. If you have ground squirrels, you might have to wait through each winter until spring to see them again. But remember, while it might have seemed like a silly or unimportant question regarding squirrels and hibernation, the same question has caused scientists and medical researchers to learn so much, and continue to learn, about this aspect of different animals. This is information that will help other people live improved lives, for much longer, and with much better health.